Innovative cloud-based screening tools that enable export, trade and OFAC compliance for tomorrow—today. Whether online or integrated into your operations, our restricted party screening solutions help keep you compliant—it's as simple as that. Odds are, we have the answers. Visit our FAQ page or contact us today—we'll be happy to help. 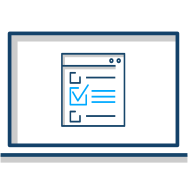 Not sure which Restricted Party Screening solution is right for your organization? Download our brochure today, or get in touch with us. We'll recommend a screening solution that best meets your needs. Restricted party screening, denied party screening, OFAC screening, watch list screening, and sanction and embargo screening—no matter what name you put on it, screening is an essential component of any export, trade, and OFAC compliance program. Not only will it help prevent potential fines, loss of export privileges, and negative media coverage that can come as a result of a violation, your organization's bottom line and reputation will thank you for having a solid screening program in place. Restricted Party Screening solutions designed to easily fit into your operational workflow. Visual Compliance® has developed a suite of premier denied party screening software solutions to help organizations fulfill their screening requirements and reach the highest export compliance standards. Versatile, intuitive—and affordable—our cloud-based solutions are configurable, working the way you work so that screening is seamlessly integrated into your everyday operations. Restricted Party Screening solutions for every step of the international trade, export and financial compliance journey—from beginning to end. screen them all at once. your existing trade management system. Failure to comply — whether deliberately or through a lack of a solid export compliance and restricted party screening program — can result in criminal and/or civil prosecution, fines, denial of export privileges, unneeded distractions, undesirable business interruptions and a damaged reputation. Our Restricted Party Screening software is trusted and recommended by customers worldwide to deliver fast, accurate, and valid results. 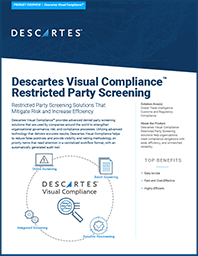 Infused with more than 35 years of collective wisdom from users in organizations like yours, Visual Compliance is the go-to choice for restricted and denied party screening. Visual Compliance can significantly reduce the pain of false positives while remaining flexible and accurate enough to comply with fast-changing and increasingly stringent regulations and watch lists. You may have an established compliance process that ensures your local compliance requirements are met, but in an international marketplace you also need to be able to deploy your screening software globally. Ensuring everyone is on the same page and using the same screening processes is tough to achieve unless you have software that works the way you work, and fits in seamlessly with your regular business processes. Visual Compliance addresses your needs with a single platform. 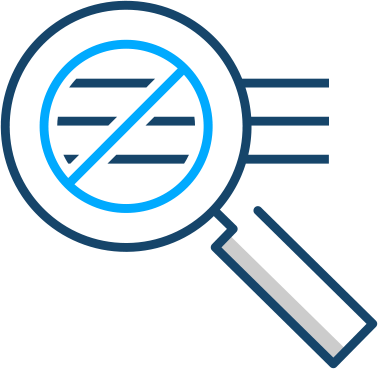 Our solution works for everyone who screens in your organization and enables the visibility that supports effective company-wide compliance. With all the different company sizes and industries we service, it only makes sense to offer screening solutions with a variety of deployment options. With Visual Compliance you can mix and match solutions depending on your requirements. You may want an online option to ad hoc screen a new customer or the occasional visitor to your premises, or batch screen for regular reviews of your customer list. You may prefer a solution that's integrated with your Microsoft Dynamics®, Oracle®, Salesforce®, SAP®, ERP, CRM, eCommerce or other system, so that screening happens automatically. Our customers love that they can choose multiple ways to deploy our software, and that no matter what their business requirements are, there's an easy and effective way to get their screening done. We understand that convincing your employees to screen can be difficult. Research has shown that software designed to enhance a user's experience can lead to quick adoption rates and high sustained use. We designed Visual Compliance with this in mind, which is why it features beautifully structured software screens, easy-to-understand instructions, streamlined task workflows, and intuitive navigation controls to provide our customers with not only advanced restricted party screening, but also the most optimal user experience. We want everyone who uses our system to feel confident in what they're doing, whether they're compliance professionals engaged in risk assessment, or front desk staff screening visitor information. It's not only who you do business with but which countries are involved. An individual or a company may not appear on a restricted parties list, but dealing with them may violate sanctions or embargoes. Each time you screen with Visual Compliance, your results return risk country notifications, alerting you to any problem countries named during the screening process. Risk countries can include embargoed countries, sanctioned countries, OFAC restricted countries, foreign-produced direct product re-exports and transshipment country prohibitions. Visual Compliance offers a robust, up-to-date database of hundreds of watch lists that includes lists from government authorities on six continents, as well as a global lists maintained by multinational bodies such as the United Nations and the World Bank. In addition to these lists, Visual Compliance is able to include supplementary watch lists as required by our clients, and our solutions include features that allow you to create your own unique screening list of customers. With the fast-paced, ever-changing nature of compliance, simply keeping up can be a time-consuming task. A solution that lessens the impact of ongoing changes can help support your overall compliance goals. Our Research and Content Group stays on top of frequent changes and provides updates accordingly. We distill the information and deliver it to you through automatic updates and email notifications to keep you in the loop. Meticulously reviewing content, verifying facts, and cross-referencing data against multiple government sources — our rigorous process means you can trust that we're on top of it, so you can concentrate on other things that matter to your business. Our customers share our belief that screening and recordkeeping should go hand in hand. Audit-readiness demands detailed proof of due diligence, documenting the who, when, what and why of screening activities for internal use or for an official audit. Visual Compliance provides a full range of audit recording and due diligence solutions that automatically record screening details and allow users to easily demonstrate their compliance activities. When a restricted party screening yields a match in your organization, can you be certain the results are being actioned appropriately? Not only do decisions need to be made about how to proceed, but they need to be made quickly, and documented in detail for future reference. 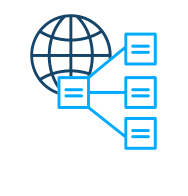 Visual Compliance's automated workflow manages the necessary actions that follow a positive match. It helps you to relay organized, detailed information to the right people to help them efficiently escalate or clear the match and record the rationale behind their decisions. You may think that implementing a reliable restricted party screening solution will be a lot of work. The fear of downtime, the disruption to regular business and the time to train users—we know these are the concerns on your mind, but once you see how our solutions work, we think those concerns can be alleviated. Designed to be easily deployed, the typical Visual Compliance user is up-and-running within a day—performing restricted party screening with minimal training while business carries on as usual. Our support doesn't stop once your screening solution is up-and-running. We are committed to working with you to help you maintain a strong compliance program. That's why you'll have a dedicated Customer Service Representative throughout your compliance journey. Participate in individual or team online training, learn at your own pace with our full library of training videos, and benefit from the collective wisdom in our Best Practices online community — it's all available to you as part of your Visual Compliance–Restricted Party Screening™ experience. We have been active members of the trade compliance community for over 35 years—working with our customers to navigate the complexities of government regulations and stay ahead in an ever-changing environment. 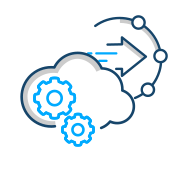 Our users benefit not only from our technical expertise, but also from the collective insight we have developed with our large and diverse customer base. One example of this is Visual Compliance–Best Practices. Best Practices is an online community that helps our customers get the most out of their Visual Compliance solutions. With one-click easy access, users can find useful tips and techniques for using Visual Compliance, which are updated weekly, along with Frequently Asked Questions from their peers in the trade compliance community. What if the restricted party screening software you buy today doesn't have the capabilities you'll need next year when your business has grown? Or in five years when your product offerings have expanded? Investing time and money in something you'll outgrow is never a good idea. That's why we provide scalable deployment options to enable and support your restricted party screening compliance goals—now, and as they evolve. You also need to know that you can depend on the companies working with you—that the services you use every day won't suddenly go down or share your data.